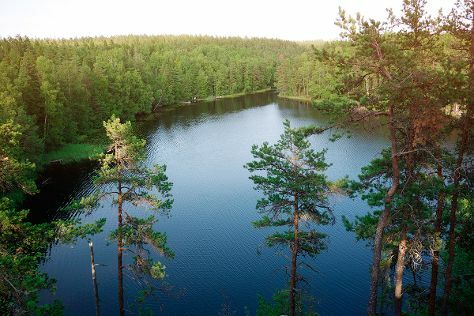 Kick off your visit on the 11th (Sat): explore the striking landscape of Nuuksio National Park. Get ready for a full day of sightseeing on the next day: kick back and relax at Aurinkolahti Beach, then take a stroll through Katajanokka, then take in the spiritual surroundings of Rock Church, and finally explore the galleries of Seurasaari Island and Open-Air Museum. To find other places to visit, ratings, maps, and more tourist information, go to the Helsinki day trip app . Ushuaia, Argentina to Helsinki is an approximately 29-hour flight. You'll lose 5 hours traveling from Ushuaia to Helsinki due to the time zone difference. Plan for somewhat warmer temperatures traveling from Ushuaia in May, with highs in Helsinki at 18°C and lows at 7°C. Wrap up your sightseeing on the 12th (Sun) to allow time to travel back home.